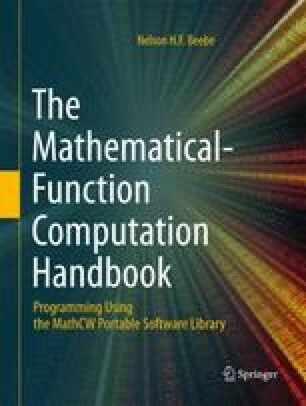 Previous chapters of this book cover the elementary functions that are taught in secondary-school mathematics, and included in many programming languages. The gamma, psi, and Riemann zeta functions that we treat in this chapter are among the most important of the class known in mathematics and physics as special functions. As the class name suggests, they are more difficult, and less-commonly encountered, than the elementary functions. GAMMA, n.: The third letter of the Greek alphabet, γ, Γ, represented historically by c, phonetically by g, in the Roman and English alphabet. DIGAMMA, n.: A name first found in the grammarians of the first century (so called because its form, F, resembles two gammas, Γ, set one above the other). A letter corresponding in derivation and alphabetic place to the latin and modern European F, once belonging to the Greek alphabet. PSI (psē or sī), n.: A Greek letter, φ, ψ. it belongs to the Ionic alphabet, and stands for ps or phs. The character may be a modification of ϕ, Φ [greek letter phi]. ZETA, n: The sixth letter of the greek alphabet, ζ, Z, corresponding to the english Z.